UNIVERSITY PARK — Neither coach was particularly pleased with the outcome of No. 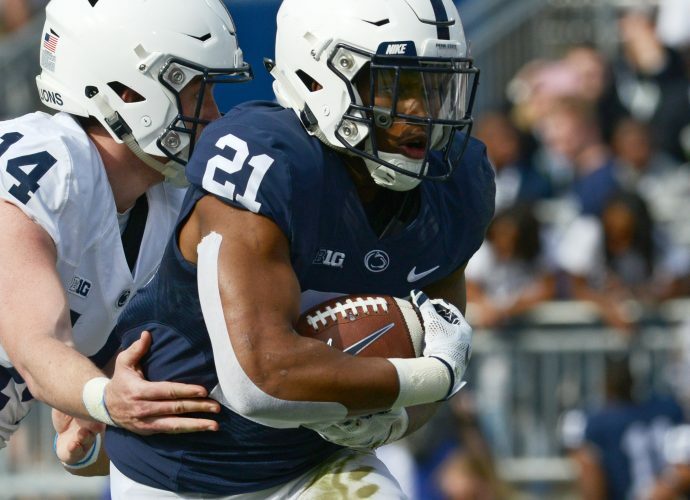 1 Penn State’s 24-13 win over No. 10 Wisconsin Sunday at Rec Hall. Despite the fact that Penn State won six of 10 bouts, amassed a 39-8 edge in takedowns and notched its 51st consecutive dual meet win, Nittany Lions’ coach Cael Sanderson placed the blame on himself for an effort that at times looked less than his team’s best. Bono, on the other hand, while pleased with his team’s effort against Penn State, and in a 17-16 loss at Rutgers on Friday, wasn’t pleased with the results. “No, our effort was there Friday night. It’s just that every dual meet is different; the matchups were different than they were here. I was happy with our effort there and I’m really happy with our effort here, but again we’re going home to Madison 0 and 2, so it’s disappointing,” he said. Even with three starters out of the lineup, the Badgers came into Rec Hall with every intention of doing anything but rolling over for the Nittany Lions. And, at the break, Wisconsin had a 10-9 lead and another sold-out crowd murmuring about the goings on. The teams swapped major decisions to start the bout. At 125 pounds, No. 15 Connor Brown of Wisconsin doubled up Devin Schnupp, 18-9, in a bout that featured an inordinate amount of reversals with seven. At 133, Penn State’s No. 14 Roman Bravo-Young picked up five takedowns in a 12-4 major over Jens Lantz. Wisconsin, though, bounced back with a pair of upsets at the next two weights. Nittany Lions’ Fourth-ranked Nick Lee ceded the initial takedown to unranked Tristan Moran and from there the match was a back-and-forth dogfight. It went into a second sudden-victory period, where Moran countered a Lee shot for a takedown and a 12-10 win. Then, at 149, No. 9 Brady Berge scored three first-period takedowns to open a 6-3 lead after a period, but could manage only an escape the rest of the way in an 8-7 loss to Cole Martin. Top-ranked Jason Nolf drew the Nittany Lions to within a point at the break. He rolled up 11 takedowns to roll to a 25-10 technicall fall over Badger backup 157-pounder Devin Bahr. Coming out of the break, Wisconsin won its final match to extend its lead to 13-9. Third-ranked Evan Wick built a 4-1 lead on backup Mason Manville, who was subbing in for Vincenzo Joseph, and coasted to a 6-1 decision. Joseph reportedly wasn’t feeling well, as was the report Friday night against Northwestern, as the top-ranked two-time 165-pound NCAA champion missed his second dual in a row. Penn State pulled out the win by sweeping the final four bouts, earning bonus points in two of them. Mark Hall hit a throw for a six-point move to close out a 24-5 technical win at 174. Third-ranked Shakur Rasheed dominated in a closer-than-the-score-indicates 5-0 win at 184. At 197, top-ranked Bo Nickal closed with a flourish, scoring nine points in the final period in a 14-4 major decision. “I think they had a good strategy coming out. They were hand-fighting hard and trying to slow us down and trying to tie us up. …definitely I think their strategy to slow us down was a good one,” Nickal said. Third-ranked Anthony Cassar closed out the meet with a dominating 11-5 win over No. 9 Trent Hillger in the only matchup of ranked wrestlers. In the final analysis, Sanderson blamed the closer-than-expected outcome, and the effort of some of his guys, on himself and a well-coached Wisconsin team. Penn State in action again Jan. 20 when it hosts No. 7 Nebraska. MILLERSVILLE – Five members of the Penn State wrestling team competed at the Floyd ‘Shorty’ Hitchcock Memorial Classic at Millersville University Saturday. Wrestlers competed both attached and unattached at the event. Redshirt freshman Jarod Verkleeren rolled through the field at 149, winning the title with a 4-0 mark. Verkleeren had two pins and a technical fall to win the title and improved to 12-4 on the year. Redshirt freshman Austin Hoopes went 2-2 at 184 and had another win against a non-collegiate wrestler (result does not count). Sophomore Justin Lopez competed 125 and picked up a victory as did true freshman Paul Feite at 157, whose win was a tech fall. Junior Aarif Asif competed at 165 as well for Penn State.